(Newser) – Autopsy details provided today at Oscar Pistorius' murder trial are so graphic that reporting and tweeting have been banned—and indeed, the findings appear to have been too much for Pistorius himself. He threw up in court as pathologist Gert Saayman discussed Reeva Steenkamp's injuries, AFP reports. His emotional reaction prompted the court's adjournment. Judge Thokozile Masipa asked Pistorius' lawyer, Barry Roux, to "just attend to the accused—not sure what's happening." 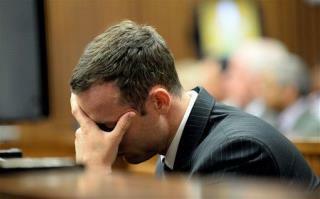 It's not the first time Pistorius has gagged in court. Reeks of cheap theatrics in order to get the judge's and home audiences sympathy. It doesn't work on me. And you bought that one? IPECAC SYRUP works!!!! !